2nd Sunday of Easter – (Year A) Questions-Doubts-Peace! • Over the next 8 weeks the Readings reflect on the mystery of Easter. Take a moment to reflect on your experience of Easter. What do you remember? What did you hear? See? Feel? What personal message do you think God wishes you to store and treasure in your spirit? On this Sunday, Divine Mercy Sunday, can you see God’s love and forgiveness at Easter? •For Jewish and Gentile converts to Christianity the break with family and social bonds caused them to be rejected and persecuted. Jewish converts to Christianity saw their own family conduct a funeral for them considering them lost and dead! Gentiles faced suspicion of subverting the social order. Peter encourages them not to be surprised. Your inheritance is waiting in heaven. Be certain that the genuiness of your faith will eventually prove to give praise to God. Do you experience being ‘tested’ by friends, family, society for your faith? Do you need to let go of some relationships and influences to remain ‘faith-full’? Does your faith ‘cost’ you anything? • The resurrection greeting Jesus gives his disciples is important. The Jewish belief was the reign of the Messiah would bring a time of peace and people living in reciprocal covenant relationship with God and one another. Peace is given by the forgiveness of sins, won on the cross, given to the Church through the activity of the Holy Spirit. While this text points to the sacrament of reconciliation, it also has within it a charge for all disciples to actively live the forgiveness they have received from Christ. 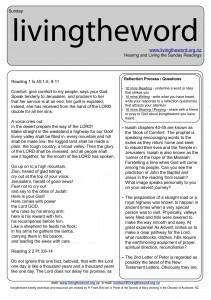 Do you recognise your call to be a living witness to the peace and forgiveness – covenant – of God? • Thomas is present within each of us and in our communities. Sometimes with disciples. Sometimes not. Struggling with questions and doubts. Do you know a ‘Thomas’? How could you support them? • The Roman Emperor of the time, ‘Domitian’ demanded people address him with the title ‘Our Lord and God’. What might John be trying to teach us in Thomas’ profession of faith? 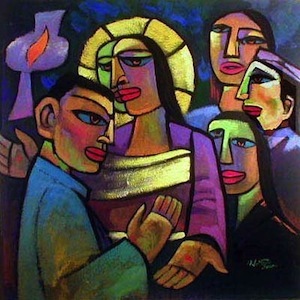 2nd Sunday Easter Yr B – show me your wounds…..
Easter lasts for 7 weeks in the Catholic experience. It is called Eastertide and marks the 50 days between Easter and Pentecost. What practice or ritual could you live for the next 50 days to celebrate Easter and let its message get ‘under your skin’ and change you? The followers of Christ became a “community”. A love in their hearts was expressed in love to others – especially those ‘in need’. What change happened in the lives of the disciples to enable them to share everything in ‘common’ so that there was ‘no-one in need’? What change am I invited to make in my own life with regard to posessions? How could I show a deeper commitment to my parish community? The victory that conquers the world is our faith. Victory and conquer are both ‘battle’ laden words. There is a ‘fight’ to be victorious over the ‘world’. It is not by ‘water’ (baptism) alone but also by ‘blood’ (sacrifice – martyrdom!). The real lived consequences of Easter challenge us: am I willing to fight the same fight Jesus endured to overcome injustice, discrimination? Only with this level of commitment will Easter Sunday Victory swallow up the evil of Friday. It is significant that immediately after Jesus’ resurrection the disciples are afraid. Locked in a room. Sacred. They are followers of a ‘rebel’ who has been crucified for seeking to over-turn the religious and political status-quo. Consider rebel fighters in Syria as a possible contemporary image. Yet the rebellion is one of bringing true peace and forgiveness. Can you experience the fear. Imagine the scene and pray with it. The final gift of Christ to his disciples as they huddled in a locked room in fear is peace and the guaranteed forgiveness of their sins through the gifting of the Holy Spirit in the Church. What is the source of your ‘un-peace’ and fear that Jesus wishes to heal? Thomas struggles to believe. He was not with the group as they saw Jesus for the first time. He wants to ‘see with his own eyes and physically ‘touch’ Jesus. He asks for some ‘signs’ to help him. What do you need in your life to help you believe and grow stronger in your faith journey? Spend time in prayer asking Jesus. The famous South African civil rights proponent Allan Boesak once stated that Jesus, at the pearly gates, won’t question us about how well we carried out our religious obligations. He’ll only ask us to show our wounds, the wounds that are the outward sign we’ve spent our lives imitating him. What if the only question Jesus asked on entry to heaven was: ‘show me your wounds’?